The happiest place on Earth! 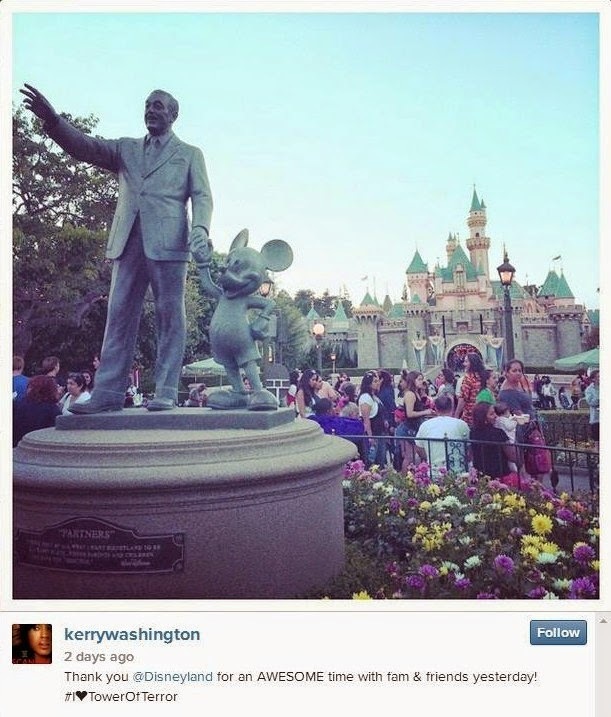 New mom Kerry Washington and her husband Nnamdi Asomugha took their 3-month-old daughter, Isabelle Amarachi Asomugha, to Disneyland and Disney's California Adventure Park on Saturday, July 19. The uber private couple were joined by members of Washington's family and friends, an eyewitness tells Us Weekly. The Scandal star kept it casual in a loose-fitting tank top and boyfriend jeans as she held hands with her husband, who donned a sweatshirt and baseball cap. As for little Isabelle, the eyewitness tells Us she has "a lot of hair and seemed cuddly and happy." Washington, who welcomed her first child in April, "held the baby while watching the World of Color show," the source adds. While they toured the park, their precious little one rested safely in a room at the Grand Californian hotel with a nanny. Washington took to Instagram after her fun-filled day, sharing: "Thank you @Disneyland for an AWESOME time with fam & friends yesterday!" shouting out her favorite ride with the hashtag "#I[heart]TowerOfTerror."